After killing the son of Twashtri and the demon Vritra, Indra was reeling under the guilt of brahma-hatya, the killing of a Brahmin, and was soon overcome by depression. Indra left his abode leaving the heavens and the earth without a ruler. Anarchy prevailed, aggravated by the absence of rain on earth and land was soon getting converted to deserts. The gods in heaven too were worried about the absence of a ruler and wondered how they would counter the attacks of asura’s if there was one. It was decided that the gods would appoint someone to rule in the absence of Indra, but who would that be? 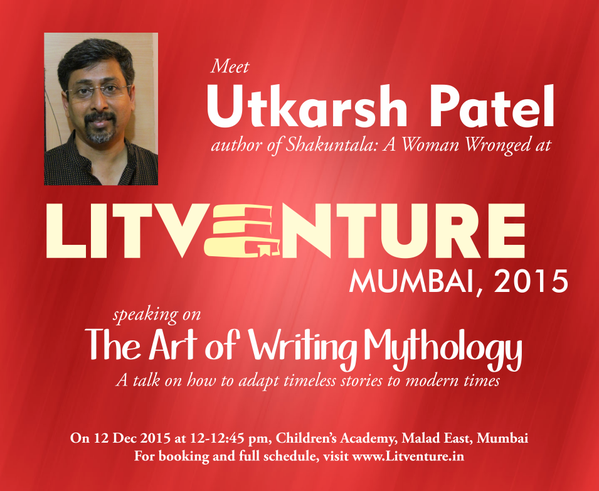 When none of the gods wanted to take Indra’s responsibility, the gaze shifted to earth. Nahusha was a great king of the lunar race and had acquired a reputation of being a brave warrior, besides the people were happy under his rule. When the gods approached him, he was rather shocked and wondered how he could rule the gods when he was a mere mortal. The gods assured him, that as a substitute to Indra, he would also have powers of Indra. Soon Nahusha was crowned as the king of the heavens, but the transfer of powers did not do him any good. He was soon arrogant and was prone to shouting at the guards and gods alike. One day, Nahusha saw Sachi, the beautiful wife of Indra in her palace and was besotted by her looks. He proposed to her and said that all that was Indra’s was now his and thus so should she. Sachi was furious, but she did not say anything and sought shelter with the guru of the gods, Brihaspati. When Nahusha learnt that Sachi had taken shelter with Brihaspati, he rebuked the sages and gods and ordered them to fetch Sachi for him or face the wrath of their new King. When they tried to reason with him, that it was evil to covet another man’s wife, Nahusha laughed at them and reminded them, that it was not unusual to covet others wives in heaven, at least not when Indra coveted the wife of Gautam and Chandra stole the wife of their guru, Brihaspati. So why were they so surprised when all he was asking for what obviously was now his? Not able to answer Nahusha, the sages and the gods soon landed at the doorstep of Brihaspati. On the advice of Brihaspati, Sachi approached Nahusha and said, that she did not mind coming over to him, provided she made sure that Indra was no more and gone for good. She asked for time to find his whereabouts and if her efforts failed, then she would be his. Nahusha found the suggestion reasonable as he was sure that Indra could never be found and agreed to wait. After some severe prayers offered to the goddess of Night, Sachi managed to find Indra who had reduced his form to hide inside a lotus. When he learnt what had happened in the heavens, he was worried as at that moment, Nahusha was more powerful as all of Indra’s powers were transferred to him. But nonetheless, Indra asked Sachi to go back and suggest that if Nahusha wanted to marry her, he should come in a palanquin carried by none other than the seven sages. 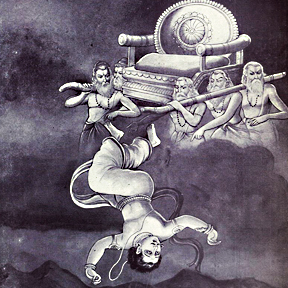 While Indra used horses for his chariot, Nahusha was different and this would make him unique. Indra further added that the rest would be taken care of by him. Sachi conveyed her desire to Nahusha, who was too happy to do as told to him by her. In the meanwhile the gods too were searching for Indra and on Vishnu’s suggestion, he was asked to perform the Ahswamedha Yagna to rid him of the sin of brahma-hatya as well as regain all his lost strength and vigour. In his desire to marry Sachi, Nahusha ordered the seven sages to carry him to the palace of Sachi. The sages had no choice but to do what was told to them. The sages carried him in a palanquin and proceeded towards the palace of Sachi. On the way, the sages asked Nahusha if they believed in the truth of the Vedas, to which the arrogant Nahusha said, that he did not believe in the Vedas. This angered the sages and rebuked him for not having faith in the Vedas. The now angry Nahusha stretched his foot out of the palanquin and touched none other than the sage Agastya. (Another version says that Sage Agastya was shorter than the others and thus the palanquin would tilt at one end every now and then leading to Nahusha not being able to sit properly and in anger he is supposed to have kicked Agastya for this discomfort). This insult of a sage was enough to rob Nahusha of all his powers. Sage Agastya immediately cursed him saying that he was guilty of three crimes, one to say that he had no faith in the Vedas, second to kick a sage and third to make the sages, each of who were equal to Brahma, carry him in a palanquin. For this crime, Agastya cursed Nahusha to turn into a serpent for ten thousand years on earth. This way, the gods were rid of Nahusha and Indra was back on his throne, after being rid of his sin. Later, we find Nahusha as a serpent in the epic Mahabharata, when he grips Bhima and agrees to release him only after Yudhishthir answers his questions, but that is another story.